Mill Road Allotments will be open under the Scottish Gardens Scheme (SGS) between 1 and 5pm on Sunday 22nd July 2012. This will be the first time an allotment opens under the scheme. Proceeds from the opening, stalls, teas etc will be split 3 ways: Highland Hospice, SGC and Nairn Allotment Society. The more longer established plots at Sandown will also be open on the same day. just a reminder we do have a local garden club and welcome new members to join us the garden club has a wide programme for the year and it runs from march to december membership for a year costs £7 50 or you could pay £1 50 on a night you would to go. what does the garden club do? well its a good place to meet like minded folk and learn something new it promotes gardening for all ages, their is a link on this webpage to the garden club why not have a look and see what we have to offer you. ...for us in the RBS Community Force bid. Especially since you had to go through the hassle of registering with the site before you could show your support. We'll know by November the 3rd if we are going to get any funding. Mill Road is full of folk who came off the Nairn Allotment Society waiting list and now the waiting list has grown considerabley once again, the Society has applied for "Leader" matched funding to enable another 39 plots to go ahead at Sandown. If the application is approved then the decision will be known in December. Now is a good time to join the waiting list. It is up in the early twenties now and will probably rise considerably once word spreads of the Sandown plan. Even if the list goes past 39 however there still may be a chance for you should this application be approved - as with Mill Road, circumstances will dictate that one or two people will drop off the list as plots become available. The application was revealed at the Society's meeting last night were members discussed a programme of events for 2012 and other options to obtain plots in Nairnshire even should the Sandown plan get the go-ahead. 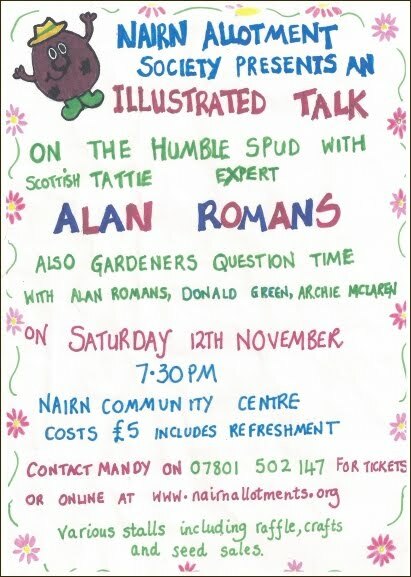 There are still tickets available for the Alan Romains tattie talk and gardeners question time on Sat 12th of November in the Community Centre - see post below. Sat 29th, Mill Rd at 11am. Nairn Allotment Society present the famous tattie Guru Mr Alan Romans.